Jeff Jacoby: On balance, was the Iraq war worth it? On balance, was the Iraq war worth it? http://www.JewishWorldReview.com | Ten years ago this week, the United States led an invasion of Iraq with the explicit purpose of overthrowing Saddam Hussein. The preceding months had been filled with vehement protests against the impending war, expressed in editorials, in advertisements, and in rallies so vast that some of them made it into the Guinness Book of World Records. With so many people against the invasion, who supported it? Well, if you were like the great majority of Americans - you did. In February and March 2003, Newsweek's polls showed 70 percent of the public in favor of military action against Iraq; Gallup and Pew Research Center surveys showed the same thing. Congress had authorized the invasion a few months earlier with strong bipartisan majorities; among the many Democrats voting for the war were Senators John Kerry, Hillary Clinton, and Joe Biden. The invasion of Iraq 10 years ago ended the reign of a genocidal tyrant, and ensured that his monstrous sons could never succeed him. Though the Iraq War later became a favorite Democratic club for bashing George W. Bush, Republicans and Democrats alike had long understood that Saddam was a deadly menace who had to be forcibly eradicated. 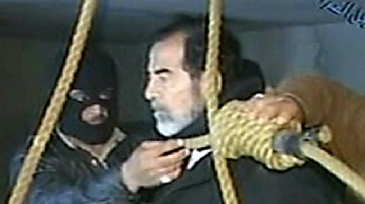 In 1998 President Bill Clinton signed the Iraq Liberation Act, making Saddam's removal from power a matter of US policy. "If the history of the last six years has taught us anything," Kerry had said two years earlier, "it is that Saddam Hussein does not understand diplomacy, he only understands power." But bipartisan harmony was an early casualty of the war. Once it became clear that Saddam didn't have the stockpiles of chemical and biological weapons that were a major justification for the invasion, unity gave way to recrimination. It didn't matter that virtually everyone - Republicans and Democrats, CIA analysts and the UN Security Council, even Saddam's own military officers - had been sure the WMD would be found. Nor did it matter that Saddam had previously used WMD to exterminate thousands of men, women, and children. The temptation to spin an intelligence failure as a deliberate "lie" was politically irresistible. When the relatively quick toppling of Saddam was followed by a long and bloody insurgency, opposition to the war intensified. For many it became an intractable article of faith that victory was not an option. The war to remove Saddam was not merely "Bush's folly," but - as Senate majority leader Harry Reid called it in 2007 -- "the worst foreign policy mistake in the history of this country." But then came Bush's "surge," and the course of the war shifted dramatically for the better. By the time President Bush left office, Iraq had been transformed from a "republic of fear" into a relatively peaceful constitutional democracy. By the time Bush left office, the insurgency was crippled, violence was down 90 percent, and Iraqis were being governed by politicians they had voted for. 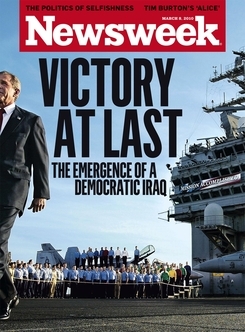 It was far from perfect, but "something that looks an awful lot like democracy is beginning to take hold in Iraq," reported Newsweek in early 2010. On its cover the magazine proclaimed: "Victory at Last." And so it might have been, if America's new commander-in-chief hadn't been so insistent on pulling the plug. In October 2011, President Obama - overriding his military commanders, who had recommended keeping 18,000 troops on the ground - announced that all remaining US servicemen would be out of Iraq by the end of the year. Politically, it was a popular decision; most Americans were understandably weary of Iraq. But abandoning Iraqis and their frail, fledgling democracy was reckless. "It freed Prime Minister Nouri Maliki to be more of a Shiite sectarian than he could have been with the US looking over his shoulder," military historian Max Boot observed this week. And with Maliki moving against his Sunni opponents, some of them "are making common cause once again with Al-Qaeda in Iraq, [which] has recovered from its near-death experience" during the surge. It is cold comfort that so many urgently warned of just such an outcome in 2011. So was the Iraq war worth it? On that, Americans are a long way from a consensus. It is never clear in the immediate aftermath of any war what history's judgment will be. Two decades ago, the 1991 Gulf War was regarded as a triumph. In retrospect, the decision to leave Saddam in power - and to let him murderously crush an uprising we had encouraged - looks like a tragic blunder. But this much we do know: The invasion of Iraq 10 years ago ended the reign of a genocidal tyrant, and ensured that his monstrous sons could never succeed him. It struck a shaft of fear into other dictators, leading Libya's Moammar Qaddafi, for example, to relinquish his WMD. It let Iraqis find out how much better their lives could be under democratic self-government. Like all wars, even wars of liberation, it took an awful toll. The status quo ante was worse.